I kind of planned to post something every day this week, just to get the blog going but yesterday really didn't leave with the time or the opportunity to take a picture and sit down to some writing. And I had a really hard time getting the pictures where I wanted them when making the kimono-tutorial on Tuesday. Today, I made the little bag you see in the picture (sorry if it's a bit blurry). It's for my mother and I need to find a belt or something like that to act as a shoulder strap. Next to it is the other half of the thrifted pair of leather trousers I made it from. The trousers may look too good to cut up, and indeed the leather their made from is in great condition and hardly shows any wear. The shape and size however, are a different story. It's a very small size, but the fly and the waist-to-hip ratio seem to suggest it's a men's garment. The legs get very narrow towards the ankle and are short, even for me. Oh, and it's crazily high waisted. So, I think it will be better off being two bags and being enjoyed as such. Why did I refer to this post as 'Thrifty Thursday', you may wonder? After all, one repurposed pair of trousers doesn't make it a post about thrifting. The point is, this is about what I do when it comes to going to thrift shops. I like to make all my clothes from scratch and have rarely found anything I wanted to own and wear in thrift shops (and stalls. When I'm at home in The Hague, all the thrift stores in my neighbourhood are of high-end expensive kind but the Monday market has several stalls selling loads of junk with some hidden gems). I tend to buy hats (when I'm in England, the Dutch hardly do hats) and gloves, look at bags and look through the clothes quickly. Clothing in thrift stores can tempt me for two reasons: either it has to be something unusual, a fifties dress for example, or it has to be good raw material for something else. So far, I've never bought any of the unusual dresses. I'm afraid I'd just be collecting more stuff to clutter up my house. Of the 'raw material' stuff, I am buying. My favorite Monday market stall puts all the small sized items, including lots of leather skirts and trousers on a '5 euro a piece' rail and occasionally discounts some of it to 2 euro. That's where I bought the trousers for my mother's bag. I've got two skirts waiting for me as well. They're what I think of as eighties things: straight skirts high waistbands, belt pleats and a 'midi-length' hemline. 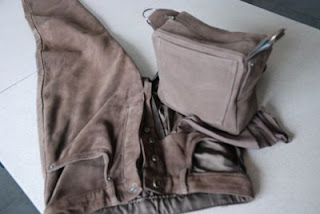 I'm also going to make a postman-style bag for my father using fabric and leather from an old motorcycle jacket a friend gave me (I gave her a bag made from half a leather skirt to say thanks) and several friends have expressed their interest in my bags. So I really hope the thrift stalls will keep coming for a while.